OK, so you’re heading to Central America, Belize. Yippee! One of your first questions is going to be “What are the best things to do in Belize?” We’ve been answering that question for over 35 years, and better yet, we’ve been traveling around Belize ourselves for even longer. This page will give you over 30 places to go in Belize, places to stay in Belize, and things to do in Belize. And you can request on the form below to have a list of our top 30 Belize things to do sent to you by old fashioned mail. You will also need to see Belize on a map. The Belize Barrier Reef ecosystem is world famous for the diversity of its sea life, the pristine condition of the coral, and the sheer vastness of the islands and reef that stretch on for miles. 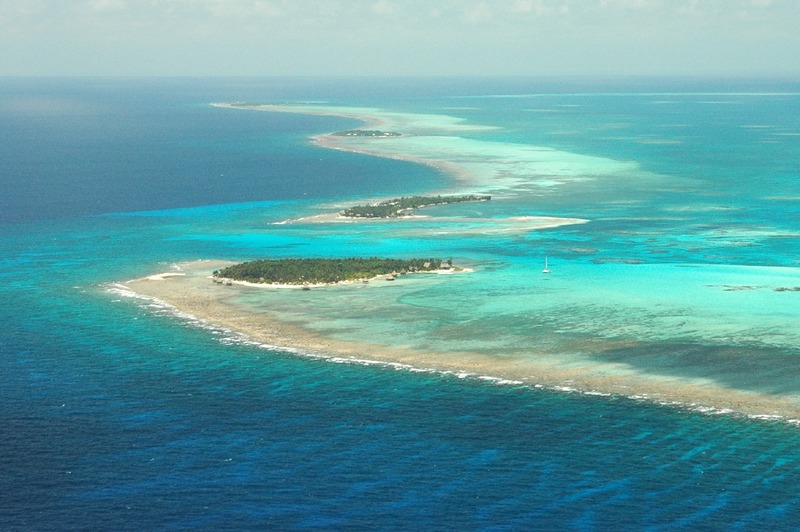 As these places become more discovered, it naturally is the hardest-to-get-to areas that remain pristine… and Glover’s Reef Atoll is the most remote of Belizean coral regions. Thirty-five miles offshore (due east of Dangriga) and 70 miles from Belize City, Glover’s is a Unesco World Heritage site and a marine park, but it is mostly protected by how remote it is. Here alone in Belize it is possible to see a hundred species within 15 minutes of jumping into the water. This is one of the only places in Belize where you can go snorkeling from the beach. Don’t miss it, these all-inclusive Belize tours are the best offered in the entire country. Phone: 800-390-5715, email: slickrock@slickrock.com. Rates are $1525 per person all inclusive for the shortest package and $2425 per person all inclusive for the full week version. 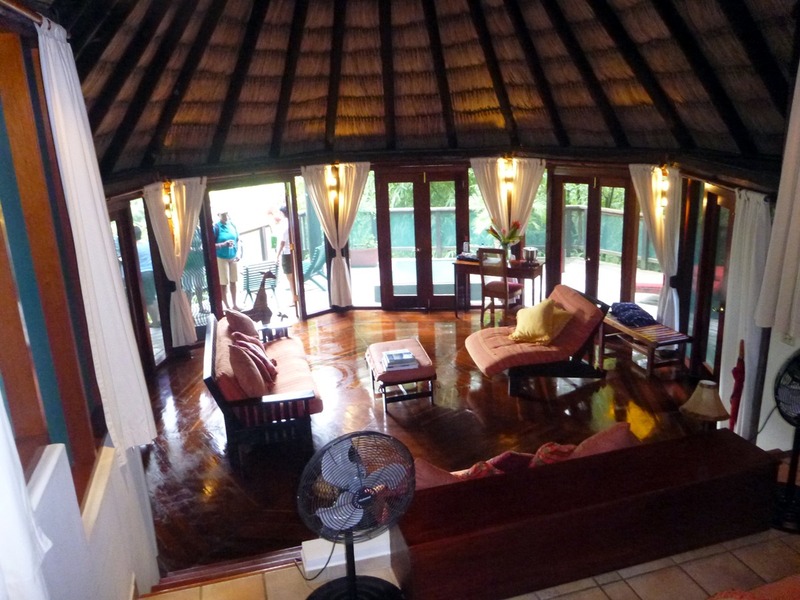 To see photos of Slickrock’s beach bungalows Belize, visit this page on our website. This Mayan ruin is close to the Belize airport, and many companies offer half-day tours. If you are arriving a day early for Belize Adventure Week this is one of the only things you could do for the day and get back in time for your flight to Dangriga. The Biltmore hotel tour desk can book you on a half-day tour for $40/person. We have more information on all Belize Mayan ruins elsewhere on our site. No list of the top things to do in Belize is complete without including the Belize Zoo. This internationally famous zoo was started as a home for wild animals that had been used in making documentary films. 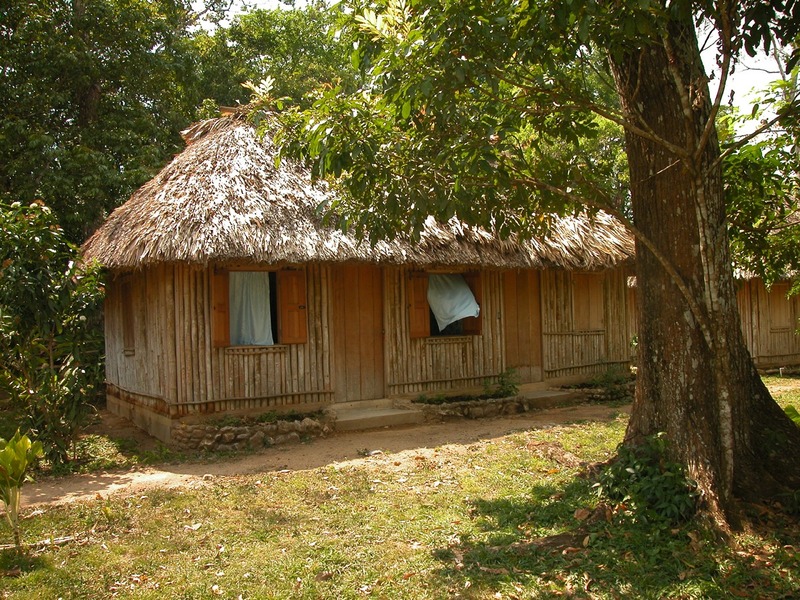 The zoo’s creators soon realized that Belizeans were unfamiliar with their native animals and they decided to develop a wildlife education center. 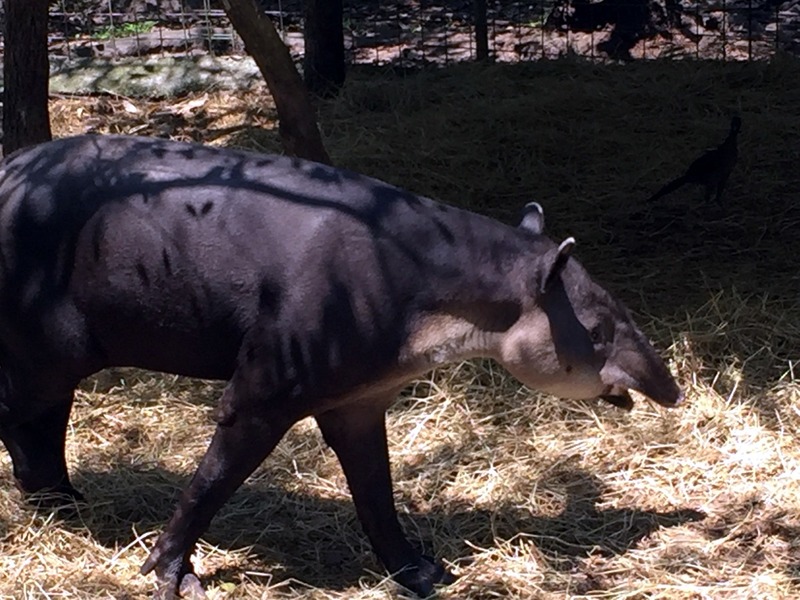 The zoo exhibits over 125 native animals, all were orphaned, born at the zoo, or rehabilitated pets. The enclosures are large, natural pens. 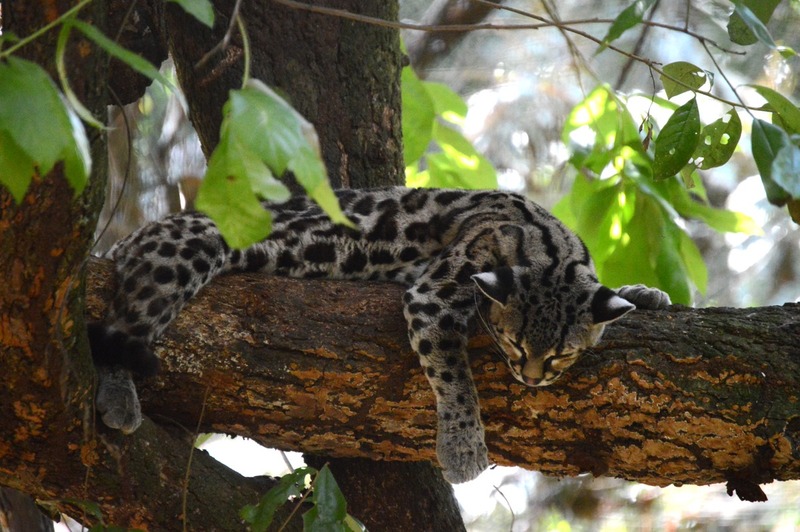 Many of the animals that are native to Belize are nocturnal, so a visit to the zoo may be the only way to see them. The zoo is located about 30 miles west of Belize City. Busses pass by regularly, and if you are comfortable standing by the side of the road waiting for the next bus on the return (as the locals do), this is the cheapest way to go. You may also take a Belize cab and ask the driver to wait for you (would probably cost $60 or so). or make a day of it and rent a car, visiting both Xunantunich ruins (west of San Ignacio) and the zoo (get an early start). Don’t miss lunch at Cheers, across the highway and down the road a little from the zoo. The zoo has a website as well: www.belizezoo.org. This lovely riverside lodge is only 15 minutes from the international airport and offers free pickup and drop off from the airport. They are located just outside of Belize City in the village of Burrell Boom where the Community Baboon Sanctuary is (home of the howler monkey). If you are arriving or departing with an extra day before or after your trip to Long Caye on Glover’s Reef, this is a wonderful option. If staying here before your trip with us, you will still have to arrange transport from here to the Biltmore in Belize City for our meeting time on Day 1 of your trip. Starting at $125/room/night, and including continental breakfast, it’s a reasonably priced lodge. You can learn more about what they offer on their website: blackorchidresort.com. 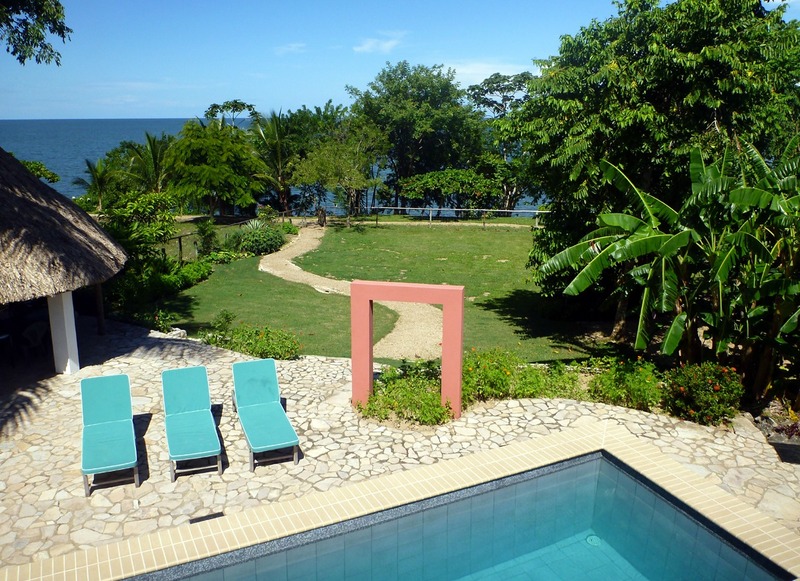 Bocawina Resort is located right in Bocawina National Park, about a 35- minute drive from Dangriga, Belize. 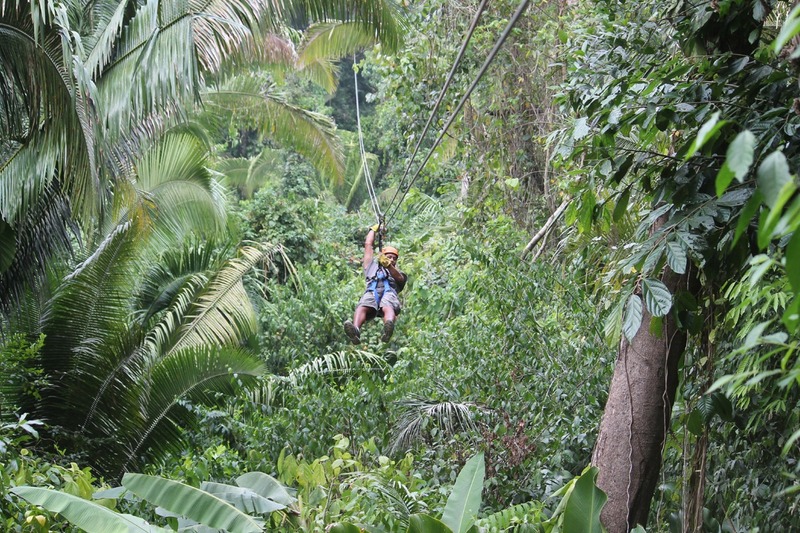 Home to the longest zipline in Central America, as well as a huge guide pool well-trained in rappelling and ziplining, you will not lack for adventure staying here! If you go, do not miss the hike to the top of Antelope Falls, a swim in the pool at the top, followed by the 300 foot rappel down the falls. The accommodations here are excellent, with good options for both the budget traveler and for those looking for 5-star lodging. Rates start at $99/night, depending on season. Contact them at bocawina.com. If you are staying in the San Ignacio it is walking distance from most lodges to Cahal Pech, so it’s a great way to spend the better part of the day without having to take a tour. It’s a 20-minute walk from town, uphill, just off the Benque road. The home of elite rulers from the Classic period in Maya history, Cahal Pech also has an excellent museum which houses a full model of the site. For more information on all Belize Mayan ruins, visit this page on our website. Caracol has recently received attention as the site of discoveries that have contributed to new understanding of the Maya. 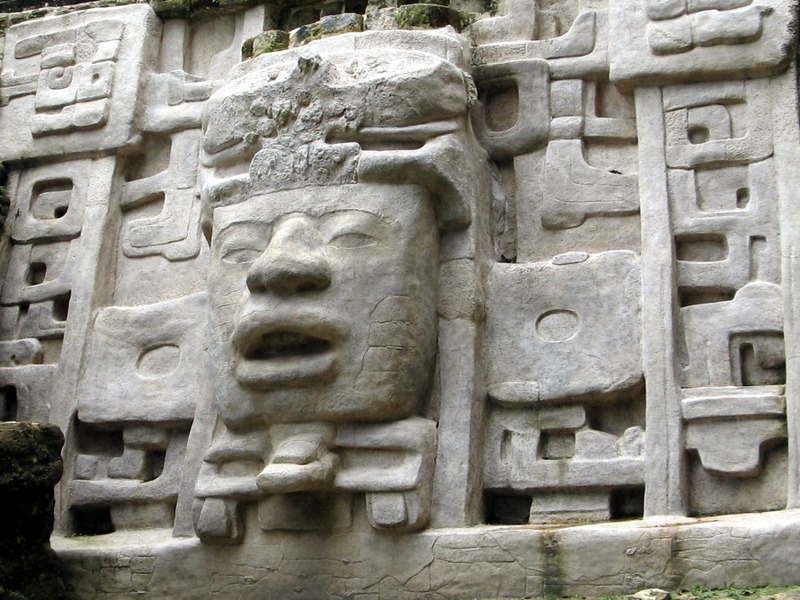 Located deep in the Chiquibul Forest and only seven miles from the Guatemalan border, the archaeologist William Coe proclaimed Caracol “the supreme Maya centre.” Caracol is much larger than nearby Tikal but is not as extensively restored. Tours to Caracol are common from all lodges in the San Ignacio area, and usually include a stop at Rio On Pools and Rio Frio cave. 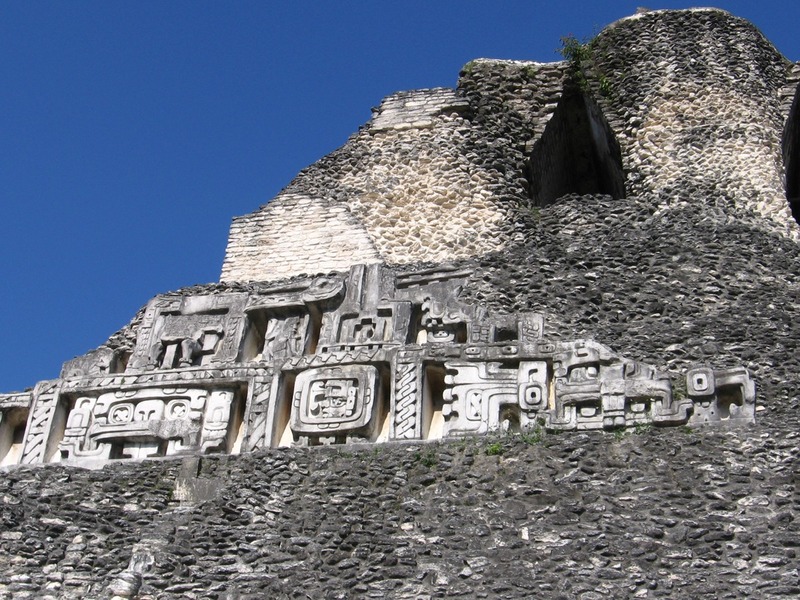 See our Belize Mayan ruins page for more information on this cultural destination. Day tours from San Ignacio are around $100 per person, many tour companies offer this tour. Kayaking Seven Miles of Caves by Headlamp! Arguably the best one-day adventure in the country, this is a “must do” in Belize activity. You may have already heard about this fabulous one day river run, which descends for miles underground. 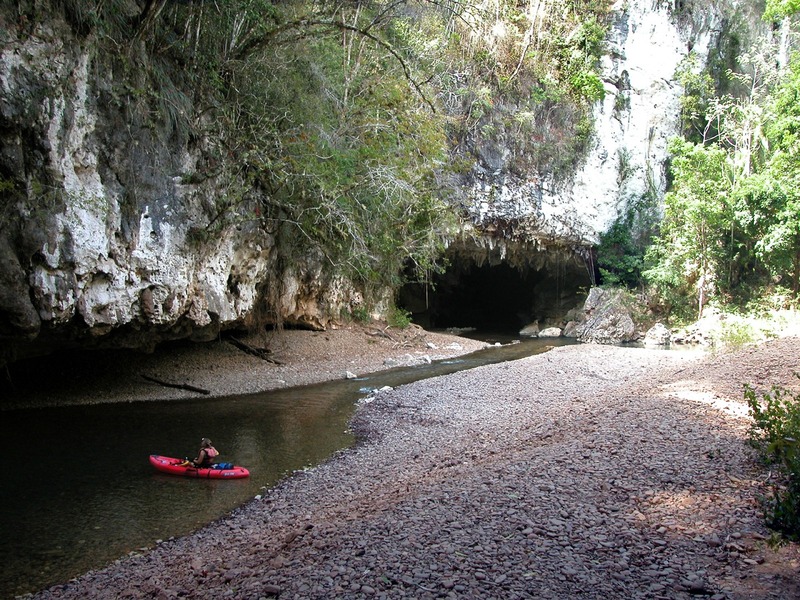 The Caves Branch River is a unique waterway that flows through the karst foothill region of the Maya Mountains in central Belize. Its headwaters are deep underground in a cave, and after emerging it flows for 20-30 miles through rainforest before joining the larger Sibun River. During its course through the jungle it encounters numerous limestone hills, and instead of following a path around these obstacles it plunges through them in a series of caves, some of which are 2 miles long. The river passes through these caves with enough clearance to float through them. There are several companies that offer a small portion of this run in inner tubes, with a schedule that caters to the brief visit of cruise ship passengers. Slickrock Adventures employs kayaks to run the full stretch of caves, offering a very exciting and comfortable way to see these incredible underground wonders. This one-day trip is offered as part of a longer adventure tour: Belize Adventure Week. It is also offered as a one-day tour for groups of eight or more. Please see our Caves Branch page for more information on this special charter. You have probably heard of Caye Caulker, and although the snorkeling and diving are not as spectacular as at Glover’s Reef where we base, the nightlife of Caye Caulker is some of the best in Belize. We don’t recommend anything at San Pedro on Ambergris Caye (the other common ocean destination for tourists) as it is quite crowded (Ambergris Caye has 200+ hotels, Caye Caulker 40+). Caye Caulker is less expensive and more relaxed. 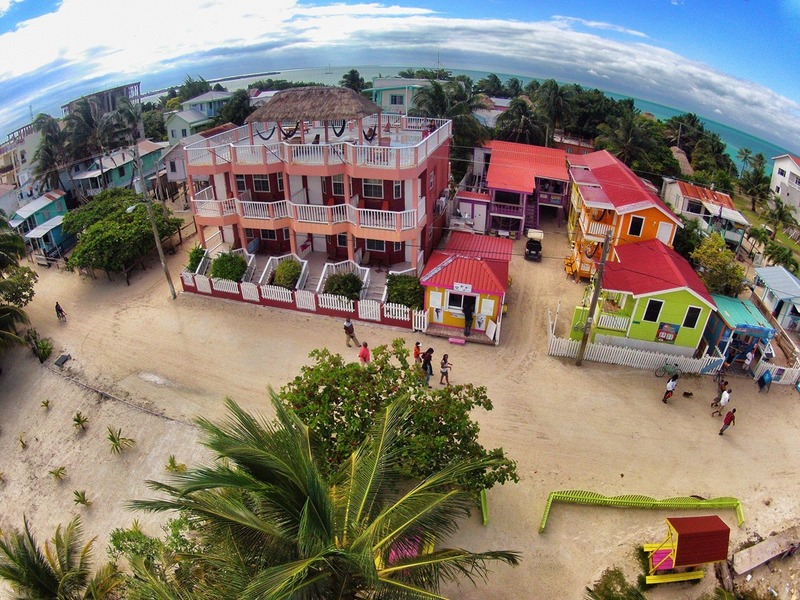 If you want luxury, Caye Caulker may not be for you. But if a relaxed, but somewhat touristy atmosphere appeals to you, we recommend staying here before our trip to unwind and get used to the heat. It is easy to get here from Belize City by boat, the fare is about $20 each way. There are three docks in downtown Belize City that service Caye Caulker. It’s best to arrive 15 minutes early and reservations are not needed. It is possible to get back to BC in time for a 10:00 a.m. flight. You can also fly to Caye Caulker, contact the airlines mentioned on our Domestic Belize Flights page. Our favorite place to stay at Caye Caulker is Caye Caulker Condos: phone: 011-501-226-0072, email: inquiries@cayecaulkercondos.com. Rates: $79-159/night. For all things Caye Caulker visit www.cayecaulker.org. 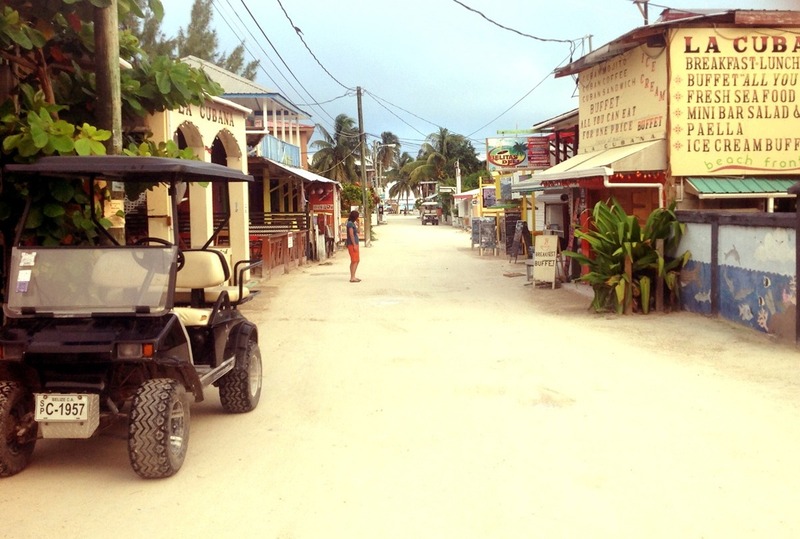 Related Blog Post: Should I fly to Caye Caulker or take the water taxi? 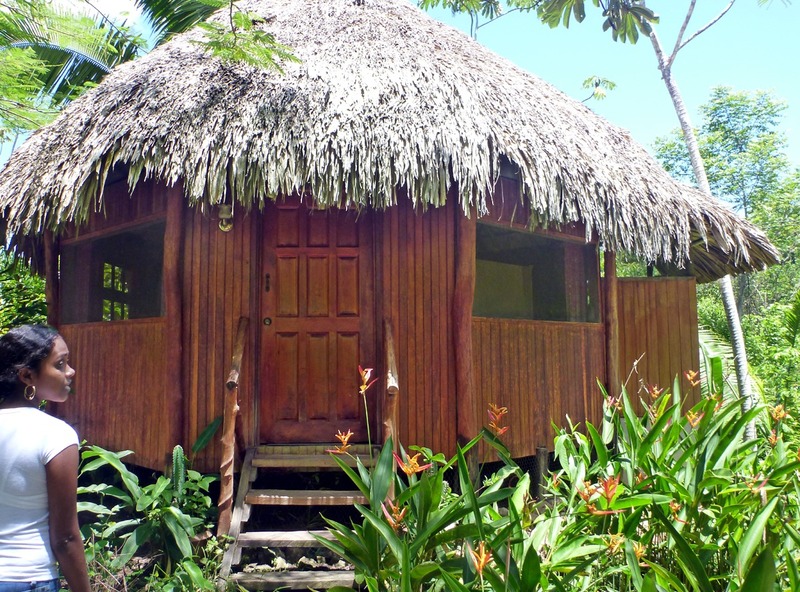 Western Belize is a popular destination, and there are scores of small lodges tucked back in the jungle. There are many great choices. All Cayo lodges can arrange tours for you, and all lodges will likely off the same list of tours. The best guided activities include Xunantunich Mayan ruin, Caracol Mayan ruin, Che Chem Ha Mayan cave, Actun Tunichil Munal cave, canoeing on the Mopan River, birding with an experienced and knowledgeable guide, horseback riding, Barton Creek Cave, Tikal, and Mountain Pine Ridge. Some lodges have an in-house tour company and some use an outside operator. The guides in this area of Belize are exceptional; the standard is very high. You will always get more out of the day with a guide rather than on your own. View our map of all eco lodges in Belize to help with planning your trip. We list our recommendations here, from least to most expensive. All rates listed are double occupancy. 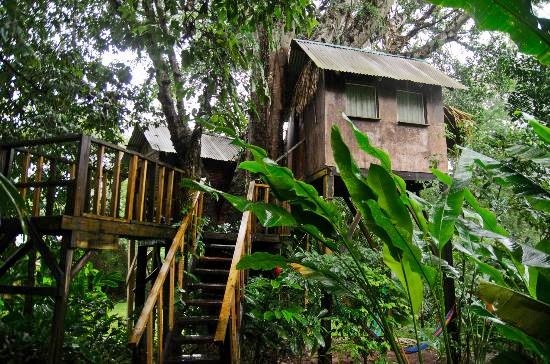 Located on the Mopan River in Bullet Tree Falls and an easy three-mile walk or taxi drive ($10 US) from downtown San Ignacio; this inexpensive lodge is a hidden jewel. Some of their cabins are tree houses. Spending the night under a 100’ guanacaste tree in a thatched tree house is like nothing else! The lodge is surrounded on three sides by the Mopan River, and parrots are in great number here, along with hundreds of other types of birds, making this an ideal location for bird watching. Coati, agouti, otter, and the giant iguana are among the many animals which are also regular visitors. The Parrot Nest has a low-key atmosphere and great home-cooked meals, but don’t expect air conditioning or private bathrooms. If you need a guide or a trip booked any adventure is just a phone call away. Rates start at $55 for a double and meals are also very reasonable. Phone: 011-501-820-4058, email: parrotnestlodge@yahoo.com, website: parrot-nest.com. 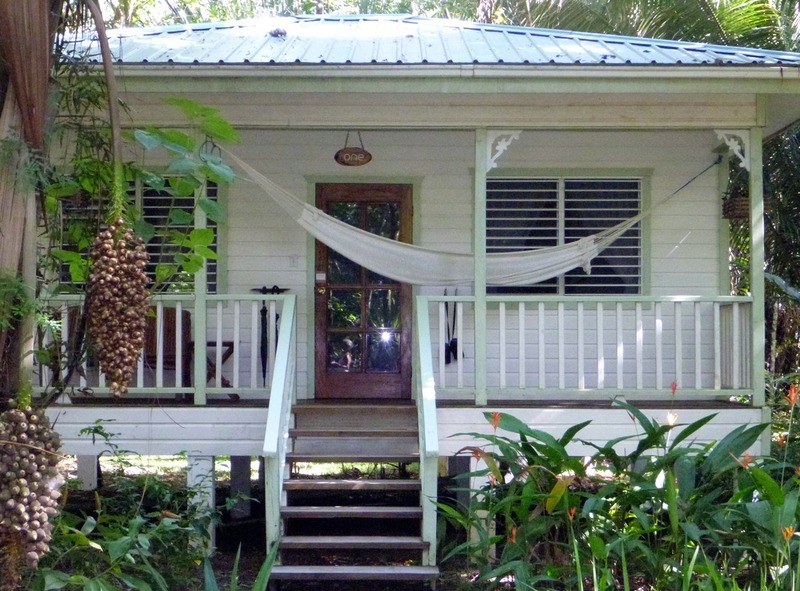 A low-cost alternative to the more expensive places in the Cayo area, Clarissa Falls Cottages is a great discovery for any traveler. Situated along the banks of the Mopan River, and just 5-1/2 miles west of San Ignacio, Clarissa Falls is very convenient and tours can be arranged for you with local operators. From here you can also go swimming, tubing or canoeing on the river, take nature walks into the forest or just relax in a hammock with a cool limonada while bird watching. One of our favorite do-it-yourself hikes in Belize goes from Clarissa Falls to Bullet Tree Falls, about 6 miles one-way along the Mopan River Valley. You can take a cab back for an excellent one-day activity. Hostess, Chena Galvez’ home cooking is fantastic! Rooms are about $75 for a double with a private bath. 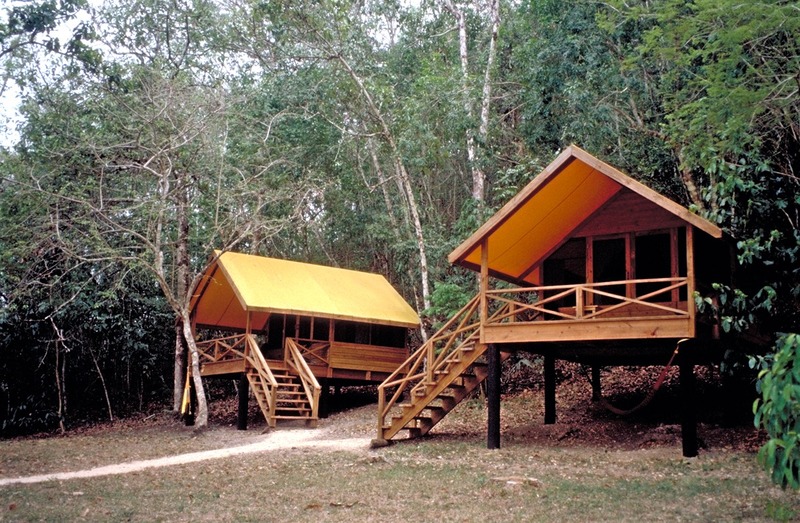 They also offer camping, which is hard to find in Belize, for $7.50 per person/night. Their meals range from $5-10. Phone and fax: 011-501-824-3916, email: clarifalls@btl.net. Website: clarissafallsresort.com If their email is not working (it seems to go out periodically), use this one: ms_chena@hotmail.com. This is our hands-down favorite, not only is one of the least expensive, but it’s the best. Who can beat that? They only have 6 tent cabins, so you will be lucky if you can get in on the days you want. 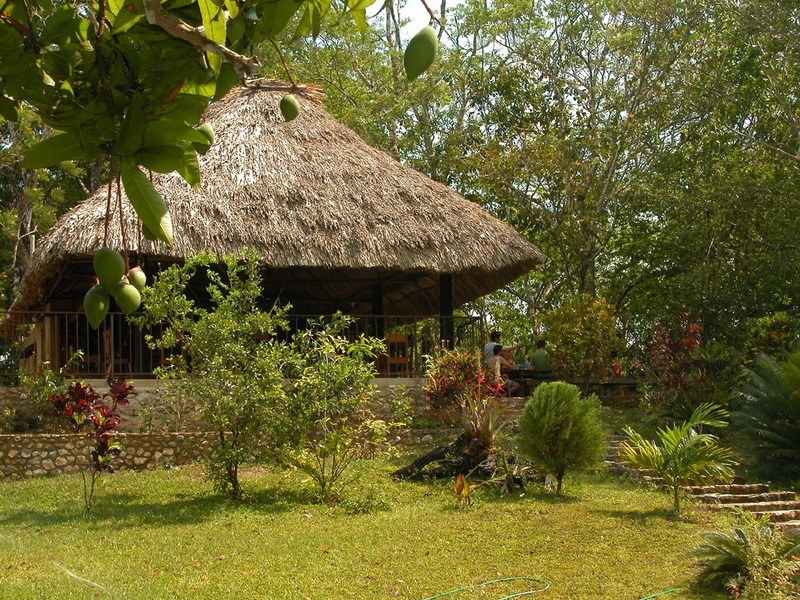 Chaa Creek was the very first eco-lodge in the country. 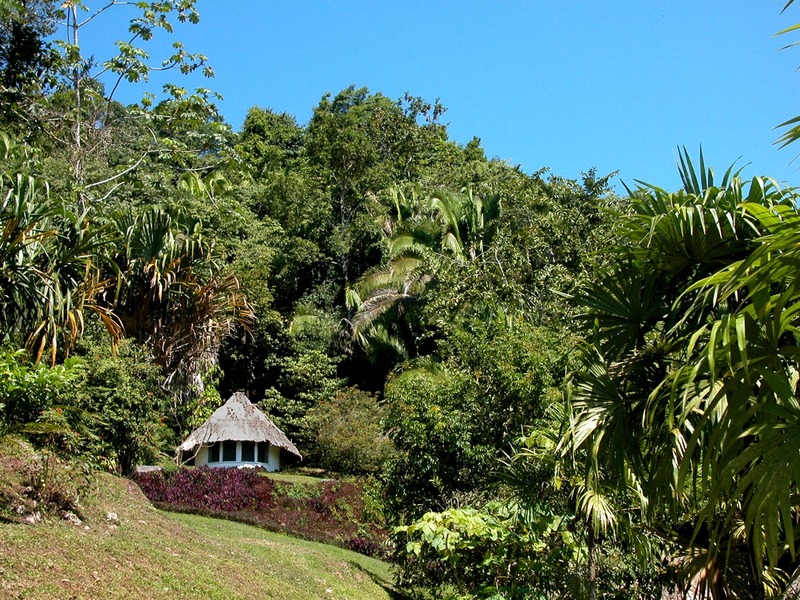 It is situated on a 345-acre private nature reserve several miles outside of San Ignacio. 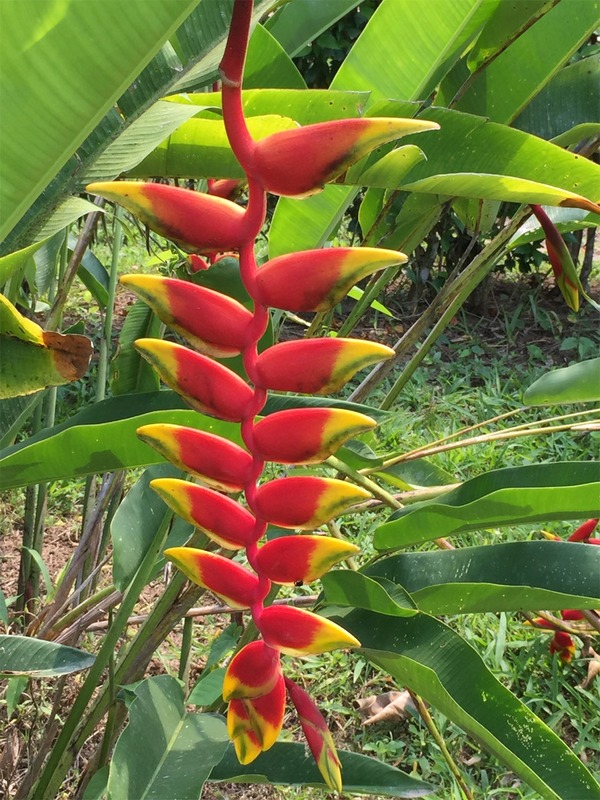 The property is located right next to the Rainforest Medicine Trail where medicines are made from jungle plants. They have an on-site natural history museum, a butterfly farm, and a full service spa. This is one of two lodging options on the property. The Jungle Camp is the nicest safari-style camp we have come across in Belize, and is much less expensive than the cottages, which are listed below. Prices are $75/day/person, including two meals (!) 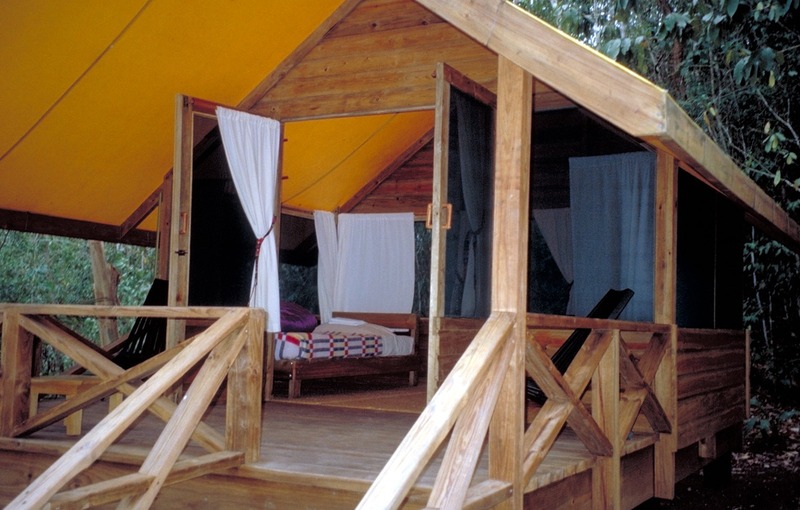 This riverside camp is located in a lush forested environment and has a dining hall, hot showers, and flush toilets. 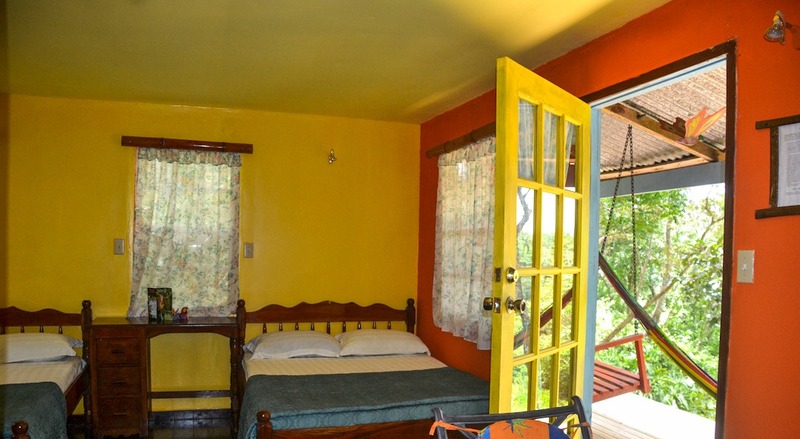 All room prices, whether for the camp or the casitas, include entry to the Rainforest Reserve, the Natural History Centre, Butterfly Farm, and Ruta Maya Trail System. Chaa Creek also provides canoe and bike rentals. Phone: 011-501-824-2037, email: reservations@chaacreek.com, website: chaacreek.com. Located in tiny Crysto Rey Village on the way to Caracol Mayan ruin, this is one of the most beautiful settings you will find in Western Belize. 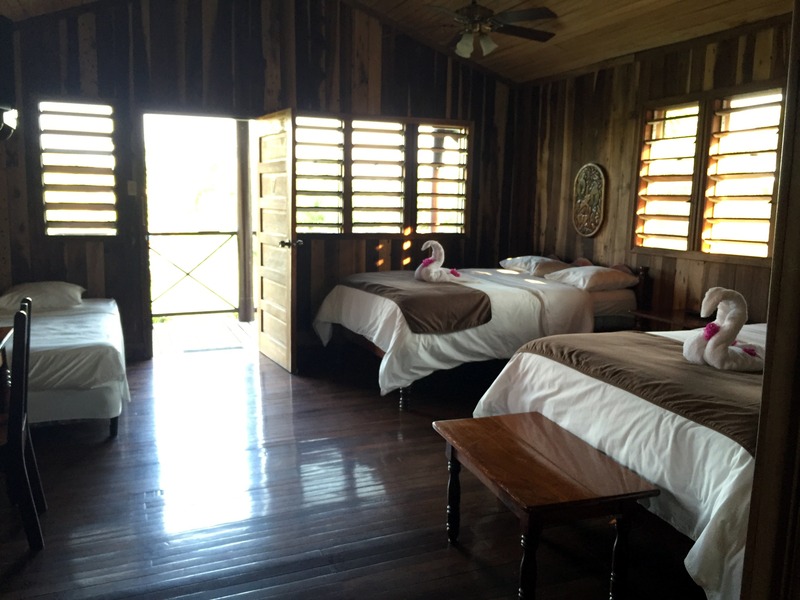 One of the few lodges owned, built, and operated by Belizeans, this lovely resort shows attention to every detail. It is also quite economical. Rooms start at $95 per night for a double, and meals are also very affordable and their bar is self-service. Contact the Tut family directly: 011-501-820-4014, info@crystalparadise.com, or visit their website: crystalparadise.com. They specialize in excellent birding tours. It is common to get in great birding sessions right from the dining hall porch. Cassia Hill Resort is located in the Cayo District, the most popular inland destination in Belize. We stay here two nights during our Belize Adventure Week all-inclusive package. It’s the perfect location for our tours because it is accessible, and yet feels quite remote. 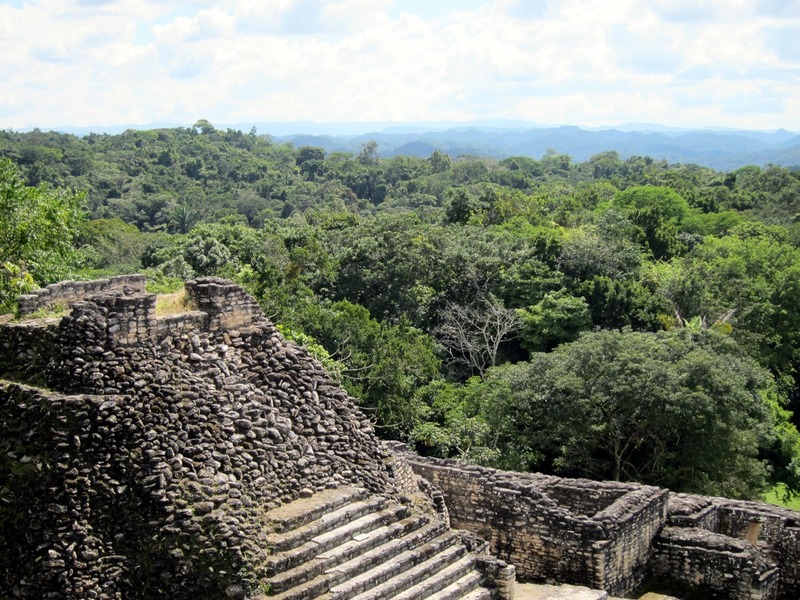 They are located near several of Belize’s greatest natural attractions including well-known Mayan temples, caves, rainforests, and jungle rivers. 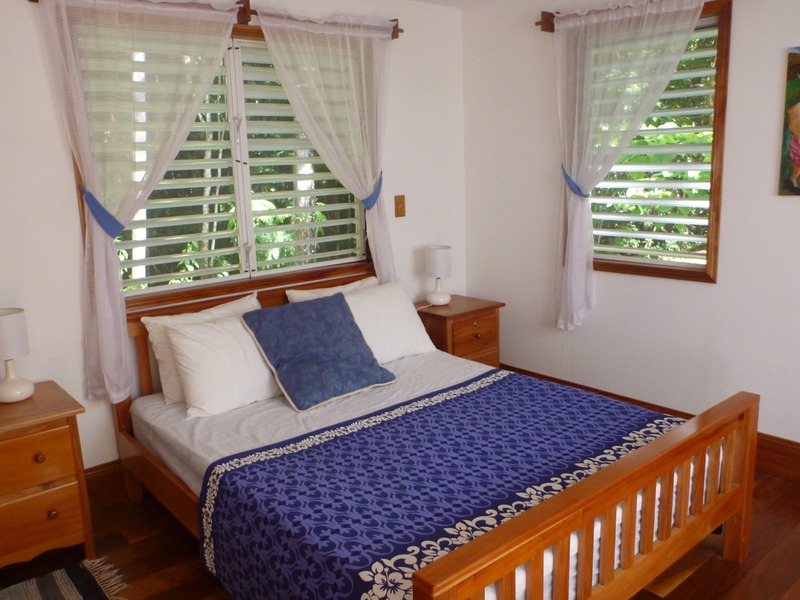 Each cottage is decorated with exotic hardwoods, local art and hand-woven rugs. All the furnishings are custom-made by local craftsmen. The resort property also features cable television, a restaurant with a bar and lounge, a recreation area and fitness center, a swimming pool, and an equestrian center. There’s also a gift shop and phone/fax/internet are available. Because it is located atop a windy hill, it is a refreshing place to return to after exploring the jungle all day. 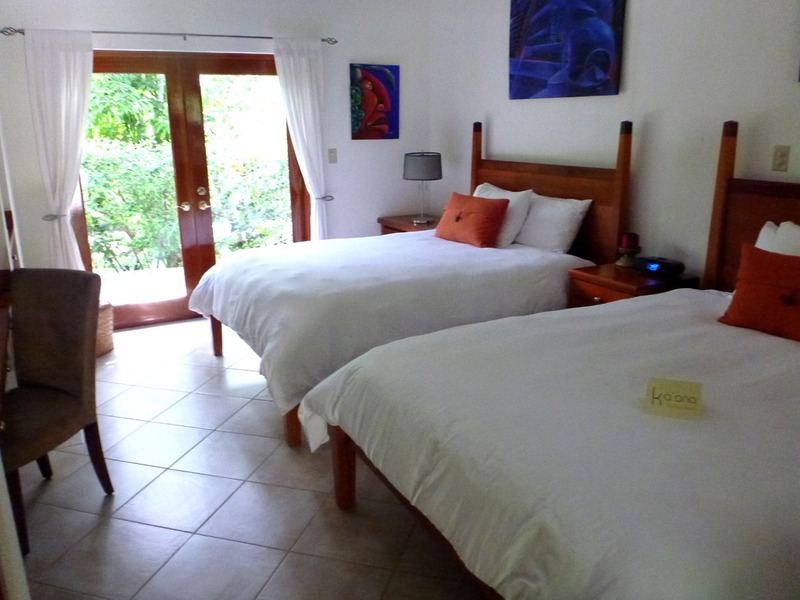 Duplooys is, in our opinion, the best mid-range jungle lodge near San Ignacio. It sits next to Chaa Creek and has a large botanical garden. The sisters who run the lodge are very nice women, and they have built up an impressive facility. This is a well-run jungle hotel that is a very good value. They have numerous levels of lodging, including whole houses you can rent. You can cook in your own kitchen, or get the meal package. Their bar/restaurant hangs over the Macal River valley, and you can bird right from the boardwalk. Because you are next to Chaa Creek, you can access their Natural History museum, medicine trail, and spa easily. They also have an in-house tour company. You can contact them via a US number: 425-254-3481, or email them: info@duplooys.com; website: duplooys.com. They have all inclusive rates, or their double room-only rates begin at $180/night (includes breakfast). For larger groups, the rates drop significantly. 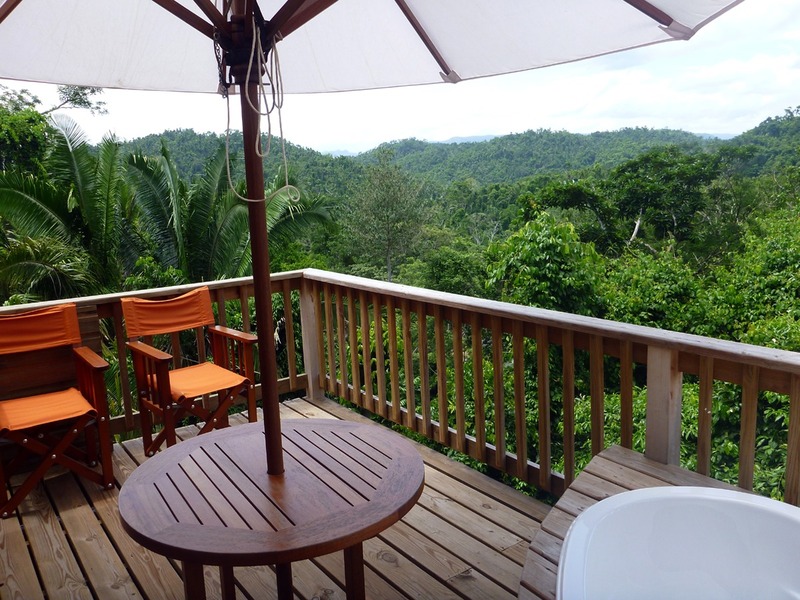 Located in the Cayo area of Belize and 5-1/2 miles from Tea Kettle village, Pook’s Hill is a fantastic jungle lodge. Their 300 acre property is about 98% dense, natural jungle, with the lodge property itself carved in the midst of a huge, jungle canopy. 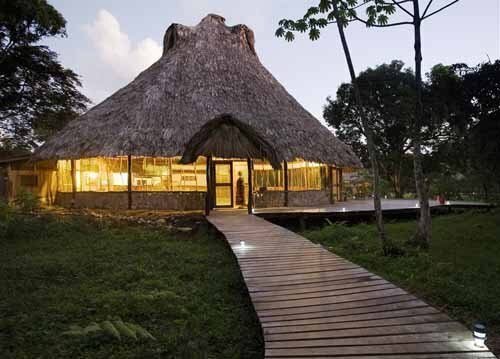 The lodge is built around a restored Mayan ruin, a rare residential site. The cabanas are first class, you won’t find anything that you could improve upon, and all have a private bath and electricity. A few of the cabins are built high on boardwalks and are perfect for birders. Pook’s Hill is only 2 miles from the Mayan cave Actun Tunichil Muknal and they offer daily tours, leaving at 5:30 a.m., hiking to the ruins in the morning mist. Their property has a network of nature trails, and a small river runs right through the property. They have an excellent library on local subject matter in their lounge area. In addition to tours of the famous Mayan cave they offer the other Belizean standards: horseback riding, Barton Creek Cave, Tikal, Caracol, Xunantunich and Mountain Pine Ridge to name a few. Their dining hall serves excellent meals for guests only and you mix your own drinks and keep track of them yourself. You will enjoy getting to know their excellent staff. Rates are $199-$285/night depending on room and season. Contact them by email: pookshill@hughes.net, phone: 011.501.832.2017 or visit their website: pookshilllodge.com. 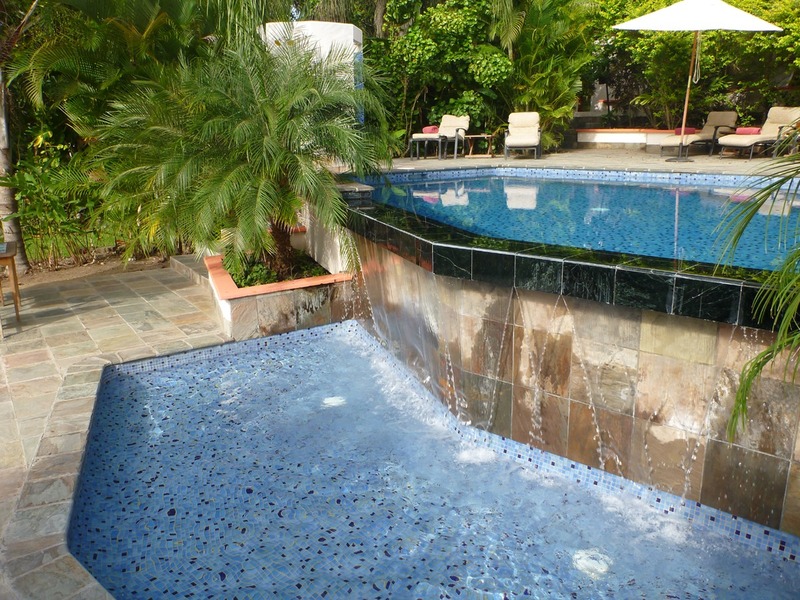 This truly lovely boutique hotel and spa lies just outside of San Ignacio. This is an excellent choice if you wish to minimize your driving time on a daily tour itinerary. It has everything you would expect a high-end resort to have: perfectly-tended grounds, spacious rooms complete with small sitting area, a glass-block window in the shower, iPod docks in each room, wifi everywhere, and an infinity pool. Each room also has a flat-screen TV, welcome air-conditioning, delicious smelling lotion in the bathroom, and outside decks. Their restaurant is beyond excellent. Phone (US number): 305-735-2553 , email: info@kaanabelize.com, or visit their website: kaanabelize.com. Rates begin at $267/night, including breakfast. This is the upscale side to the Macal River Jungle Camp, listed above. 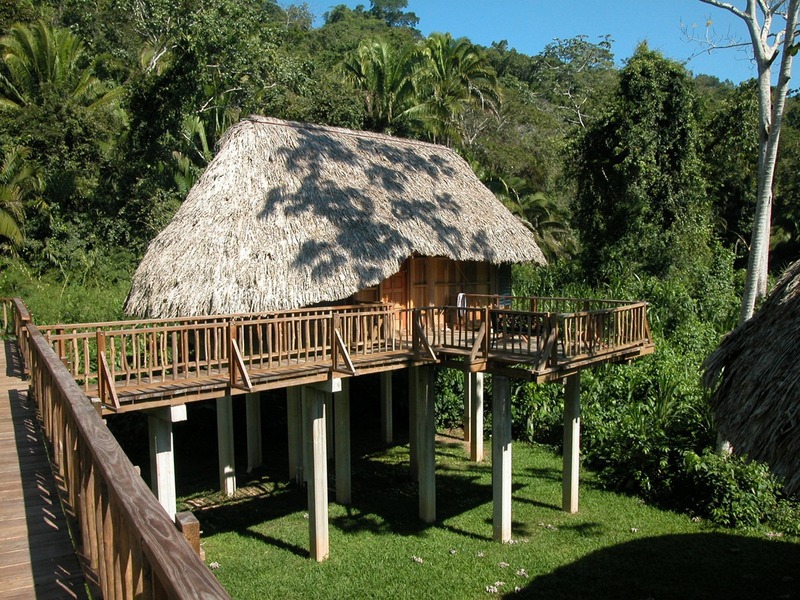 See the Macal River Jungle Camp listing for more info and contact information. One of the top Belize Things to Do, Crooked Tree is a wonderful Belizean village. Located on a shallow, fresh-water lagoon, the village is surrounded by the wildlife sanctuary and has four small lodges and a few restaurants. With a population of only 1000 people, 120 square miles of land are considered to be part of Crooked Tree. This is arguably the best place for birders in the country, and more than 300 species have been recorded here. A few years ago we went up to the village to collect information for this posting on our website. The lagoon was very dry, we went during the hot mid-day (due to impulsive planning on our part), and we took an abbreviated tour for only one hour. Even with all of this working against us, we saw 29 species. Our Bird’s Eye View Lodge guide, Felipe Moh, was fantastic. You could hear the excitement in his voice when he spotted the rare agami heron (I was so excited I forgot to take a picture!) We watched this magnificent bird stalking fish along the shoreline for at least 10 minutes. In addition to this sighting we saw: ring kingfisher, grey-necked wood rail, boat-billed heron (also rare), great blue heron, neo-tropic cormorant, woodstork, limpkin, prothonotary warbler, osprey, black vulture, black-crowned night heron, great egret, green heron, tropical kingbird, orchid oriole, black-cowled oriole, juvenile black-collared hawk, belted kingfisher, snail kite, little blue heron, tri-color heron, blue-wing teal, American white pelican, jacana, white egret, and snowy egret. 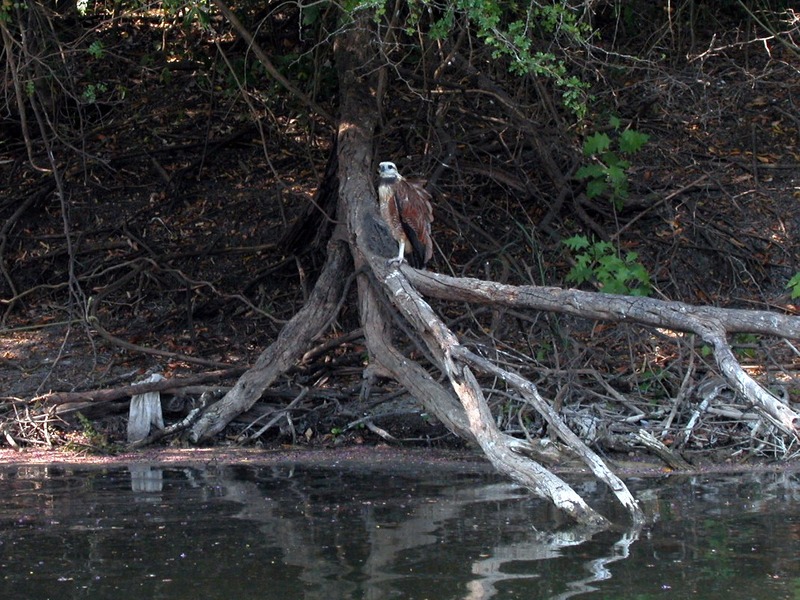 We also saw two bare-throated tiger herons in the middle of a territorial dispute. It was incredible! Our guide also reported frequent recent sightings of the enormous jabiru stork (wingspan: 10-12 feet), the pinnated bitter, a rare northern lapwing from South America blown off-course, rosette spoonbill, glassy ibis, white ibis, white-crowned parrot, and the American coot. Of the four lodges at Crooked Tree, we feel that the best choice is the Birds Eye View Lodge. Situated right on the lagoon, it is simple but clean and comfortable, with an excellent kitchen serving buffet-style meals to their guests. Those of a certain age will be reminded of American lodges in the 60s. They have a small bar and their in-house tour company is excellent. Rates are from $100 a night for a double, depending on room and on season, and meals are also reasonable. Breakfast and lunch are each $15, dinner is $19 and they will accommodate vegetarians. 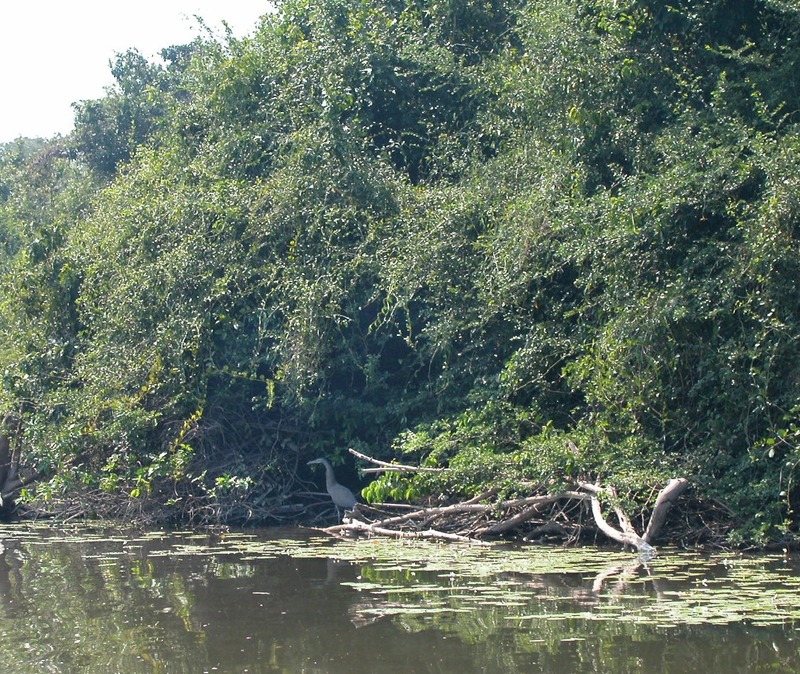 The birding/boating tour for 1-3 persons is $125, each additional person is $35. Birding tours last about 3 hours, starting at 6 a.m. Contact Kira Jiminez: 011-501-203-2040, birdseye@btl.net, or visit their website: www.birdseyeviewbelize.com. Crooked Tree is only 40 minutes from the Belize International Airport; a perfect choice if you are flying in a day early for one of our adventure trips. They will pick you up at the airport for $75 US (one way) for 1-3 persons; each additional person is $20. You can stay the night, take an early morning birding tour, relax the rest of the day or tour the village, and have them drop you off at the Biltmore in time for our meeting on Day 1 of your tour with us. You can also travel here on your own just for the day in a Belize car rental, but we recommend booking a birding tour in advance. If you are thinking of visiting Crooked Tree, don’t expect great shopping, nightlife, or the Radisson Hotel. Accommodations are clean and simple, the village is quiet. What you can expect is to meet very nice local people and to be guided to see some of the most beautiful birds in the world. If you want to see the real Belize, you should not miss seeing Dangriga and the village of Hopkins. 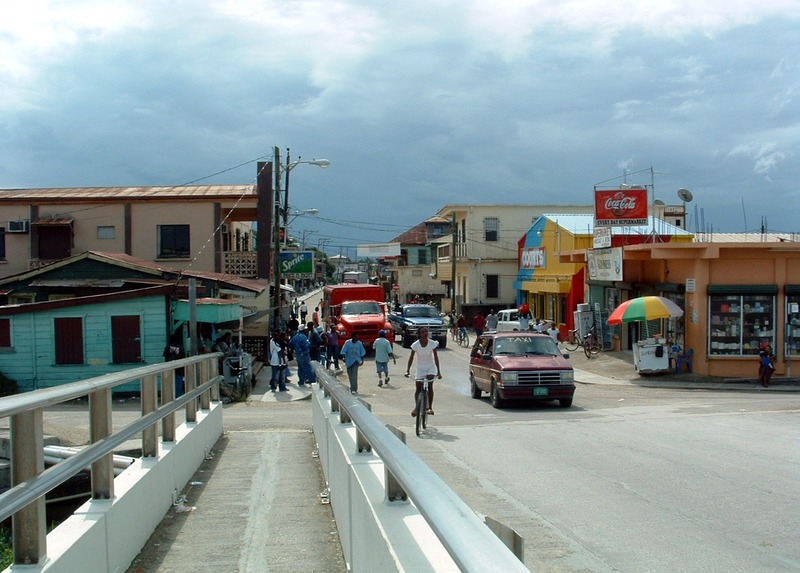 Although small by American standards, Dangriga is a regional center and has a decidedly urban atmosphere. Don’t expect manicured beaches, good espresso, or shopping; this is where you go to immerse yourself in the culture. Hopkins retains a more relaxed, small town atmosphere but has recently become the focus of much tourism development. Huge new hotels, condo developments, and a new marina have recently been built on the outskirts of town. Both Dangriga and Hopkins are Garifuna settlements; these people are a distinct ethnic group of West African and Caribbean Indian ancestry who arrived in great numbers early in the 1800’s. 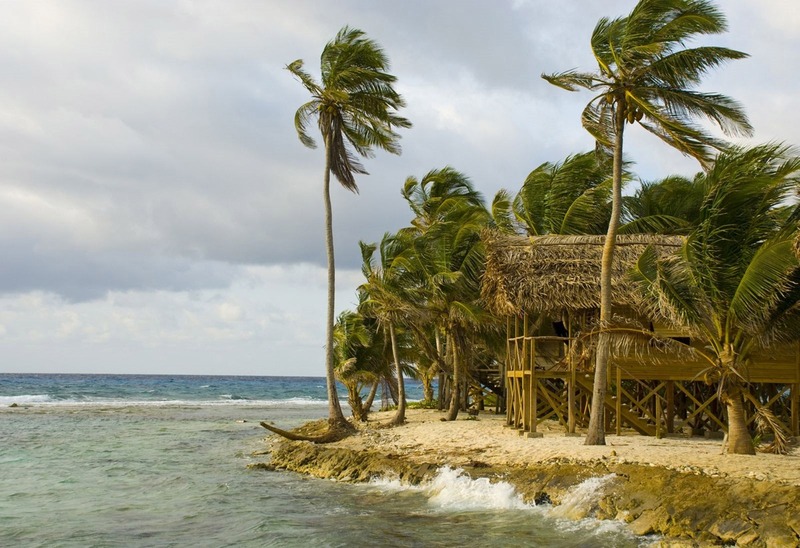 Originating in the Lesser Antilles, shipwreckedHopkins Village, Belize slaves inter-married with the locals and developed their own customs and rituals. When the British eventually took over their islands they fled to Honduras and then on to Belize. Dangriga is the largest Garifuna settlement in the world. If you have the time, we recommend visiting Hopkins and spending time getting to know the local culture. If you are lucky, you may get invited to a party, which will include drumming and dancing. You can fly or take a bus to Dangriga and then take a bus to Hopkins. 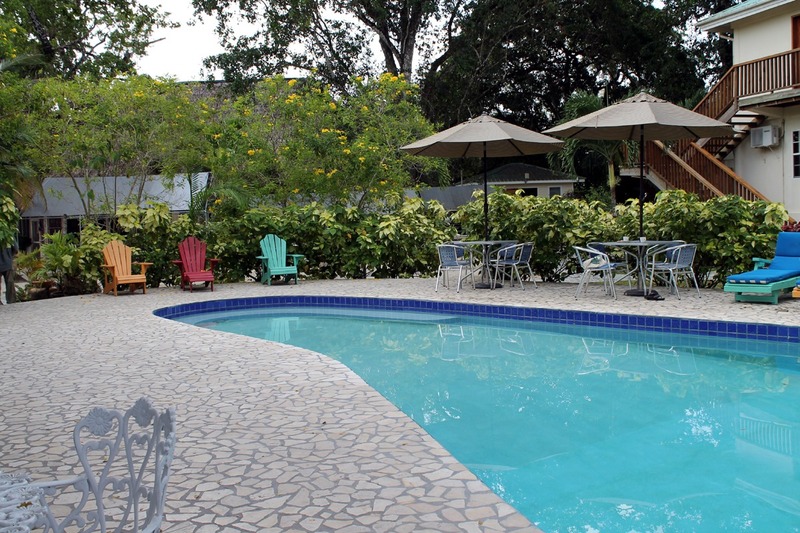 In Dangriga we recommend the Chaleanor Hotel. 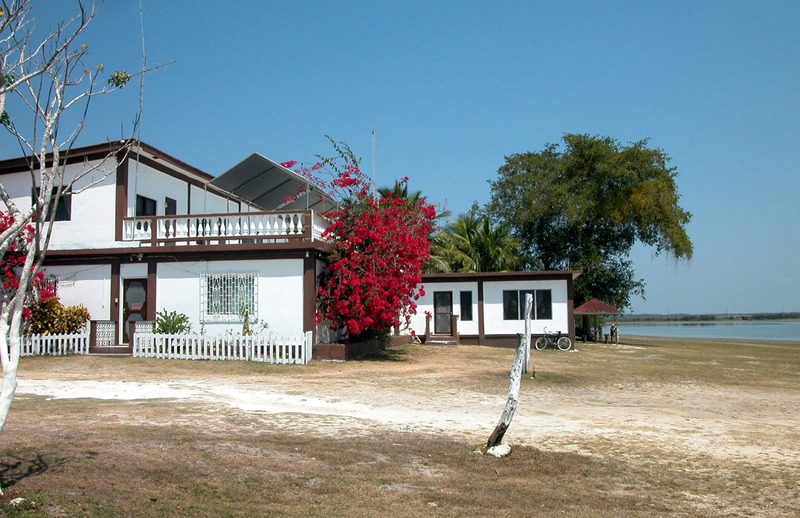 The Chaleanor is a Belizean style hotel in downtown Dangriga. It’s not fancy, but quite reasonable and clean. Website: chaleanorhotel.com, phone: 011-501-522-2587, email: chaleanor@btl.net. Rates are $75 for a double including the tax, which few hotels do, so most Belizean hotel’s prices always sound less than they are. A Great Place to See the Monkeys! The Howler Monkey Resort is located in the village of Bermudian Landing, about 45 minutes to an hour’s drive from Belize City. 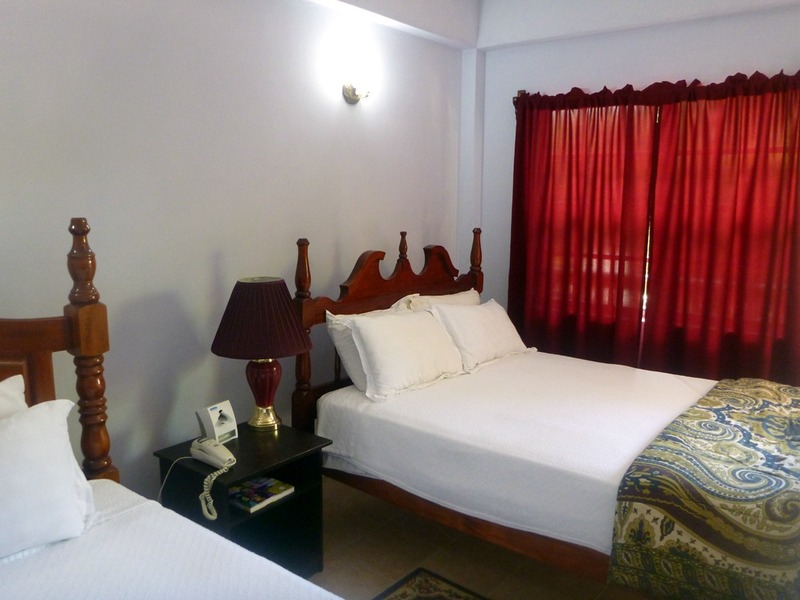 Situated right on the Belize River, it is a wonderful place to stay, if for only a night, or stay for several to see many of the local sites. Bermudian Landing is the headquarters for the Community Baboon Sanctuary and if you stay here you will DEFINITELY see the Black Howler Monkey (locally called “baboons”) up close and personal. In addition to that, they offer tours to other nearby sites like Lamanai, Altun Ha ruins, the Belize Zoo and other destinations. Because it is so close to Belize City, this is a possibility even if you only have one extra day to add on to your longer tour. They offer packages which include lodging, meals and tours, or you can buy everything ala carte. Double occupancy rooms range from $98 – 139/night. This is a very affordable lodge in a stunning setting. Website: http://www.howlermonkeyresort.bz/, Email: mel@howlermonkeyresort.bz, Phone: 011 – 501-607-1571. This remote jungle lodge is a real find. Located on the Hummingbird Highway between Belmopan and Dangriga, the lodge is home to some of the best adventure tours in the country. Ian pioneered cave exploration in Belize; he employs all Belizean guides and trains them himself in caving safety. His lodging covers a wide range from simple jungle cabanas with shared bathrooms to his amazing 5-star treehouses. Phone:011-501-673-3454, email: info@cavesbranch.com, or visit their website: cavesbranch.com. He has a 3 night minimum and all prices are all-inclusive, including meals and daily adventure tours. From $772 per person for 3 nights, his least expensive lodging option. The Belize government protected the Cockscomb Basin as a Wildlife Sanctuary due to an ecological study conducted in the 1980s. Much to everyone’s surprise, it was observed that the Cockscomb Basin contained the highest density of jaguars ever recorded. 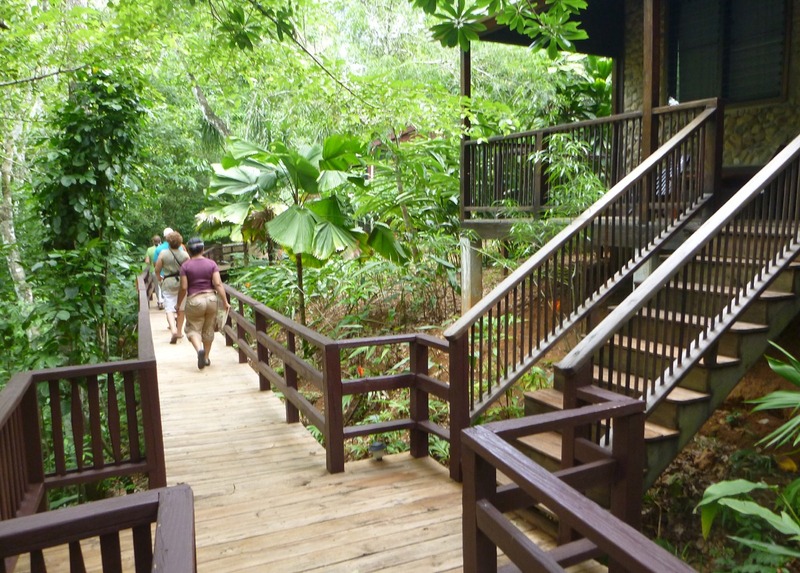 The Jaguar Preserve has some of the best hiking in Belize. Over 250,000 contiguous acres are protected in a completely natural state. There are miles of trails contained within this great area, along with creeks and rivers, waterfalls, and even jaguars (rarely seen). The problem is it’s a little hard to get to, a bus will drop you off at the Maya Centre along the Southern Highway, but you have to hitch the last 7 miles. You can visit for the day by hiring a taxi from Dangriga or Placencia, or purchase a tour from any lodge in Dangriga, Placencia, or Hopkins. 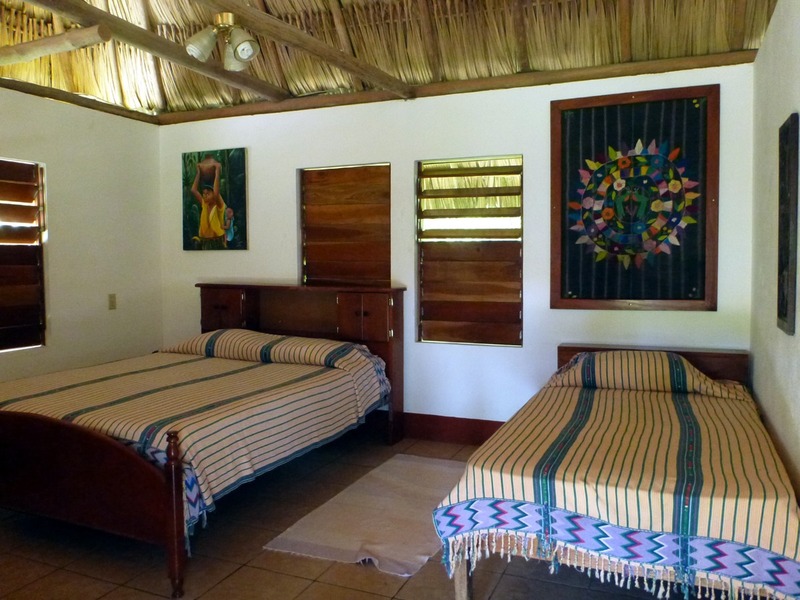 You can also rent a car in Belize City and spend the night in campsites, dorm-style rooms or one of their cabins. The entrance fee is $5, camping is $10/person/night and the dorm is $20/person/night; the cabins range from $55-82/night with additional charges for additional people. You must bring your own food and water, although they will rent you cooking equipment or tents. Visit the Belize Audobon Society’s website for more information: belizeaudubon.org/?page_id=3605, and view this page for more information on lodging options: belizeaudubon.org/?page_id=3607. This tour is a no-brainer if you are flying in one day early, it is our favorite one-day tour out of Belize City. However, this isn’t an option for Belize Adventure Week participants, because it returns too late for you to catch the last flight to Dangriga for your meeting with us. The Lamanai tour is offered every day of the year, and they pick up and drop off at all Belize City hotels. A 1.5 hour bus ride takes you to the New River. The banter of the guide is a little cheesy here, but this is not an omen for the rest of the day, don’t worry. At the New River bridge you are transferred into jungle river cruisers that boat upstream about an hour to the ruins, stopping often to view the exotic wildlife along the river banks. On one trip our fantastic guide pointed out about 15 different tropical birds including: green-backed herons, olivaceous cormorants, jabiru stork, northern jacana, and purple gallinules. Crocodiles and blooming water lilies are also profuse. Arriving at the ruins, lunch is served and the tour that follows includes excellent interpretation. The tour is $128/person and can be booked at the Biltmore travel desk upon arrival, contact for info: papagallogiftshop@gmail.com. (Confirmed Slickrock guests are given a $10 discount, and kids also receive a discount.) What to bring: binoculars (a must! ), money for the gift shop, rain and warm gear (the boat ride is cold, and if it rains you’ll get wet too), bug spray, your iPod for the boat ride back (the engine is noisy). This is a fantastic tour, don’t miss it. 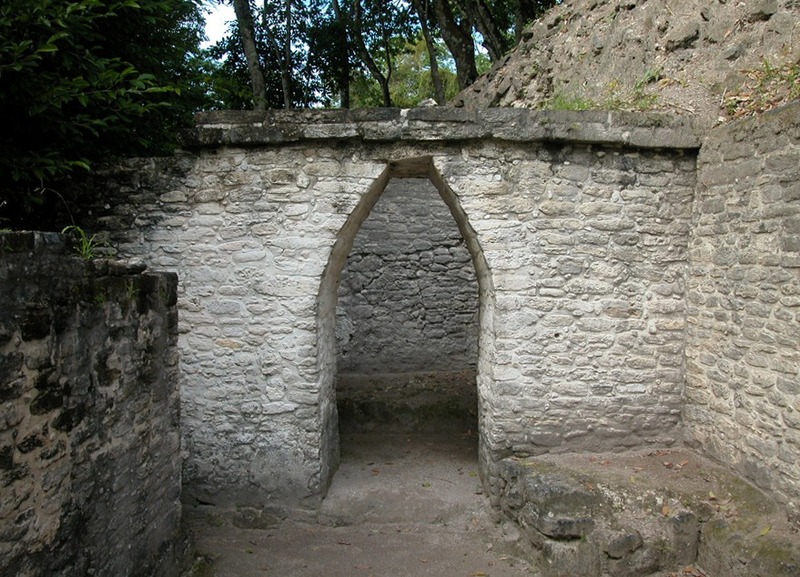 For more information on Lamanai and all other Belize Mayan ruins visit this page on our website. The Mopan River is a major tributary the Belize River, the country’s primary watercourse which flows across the country to the sea. 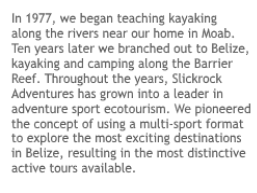 Slickrock Adventures runs a whitewater section of the Mopan as a instructional kayaking adventure. 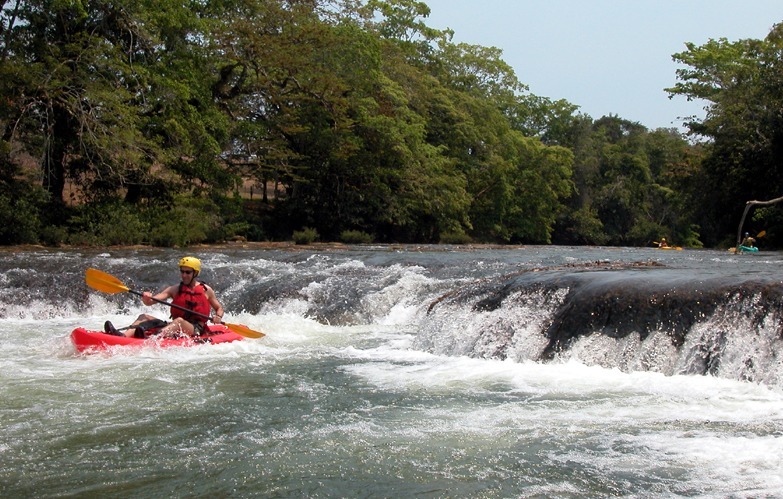 This exciting stretch of the river contains Class II-III rapids, and our guides include a land-based orientation for the group before putting in. Additional instruction is given throughout the run, which include reading the whitewater, learning about obstacles, and surfing the river waves. Abundant birdlife and huge iguanas are encountered on the river at nearly every bend. This one day trip is offered either as part of a longer trip in the Belize rainforest: Belize Adventure Week, or as a one-day Belize adventure for groups of eight or more. Please see our Belize river kayaking page for more information on this special charter. “PG” is all the way south in Belize in the Toledo district, almost to Guatemala. It is still like it used to be, a remote jungle area by the sea, where many of the locals have little contact with the rest of Belize. In fact, in no other part of Belize can you visit both jungle, ruins and caves and go diving or snorkeling at the Belize Barrier Reef from one location. PG has it all. Except many tourists. Which, of course, makes it even better. You should not plan to travel to PG with only a day or two. It takes longer to get there than any other part of the country, and a flight there will add significantly to the price of your trip (about $185 per person, one way). So plan to spend at least four days there to make the added costs and time worth it. View our Belize jungle lodges map to help with planning your trip. A nice choice for the budget traveler, this lodge is very basic; some of the rooms share a bathroom, but there are some nice touches. If you wish to rent a full house, they offer one at a very good price. Rates are from $60 for a double, includes breakfast. Contact them at suncreeklodge.de. Although quick and easy to get to, this wonderful little lodge is out of town and feels very private. With only 7 cottages, they fill up quickly. Run by a wonderful American couple, their service is excellent. He used to teach horticulture at a US university, and their grounds reflect this interest. This is an excellent home base for all that PG has to offer. Breakfast, wifi, use of bicycles, and once-a-week drumming lessons are provided for all guests at no additional cost. Rates start at $95 for a double, depending on room. Contact them at hickatee.com. Located right in downtown Punta Gorda, this tasteful B&B is a find. They have only 4 rooms, each with air-conditioning, wifi, television, and a private bath. Here you will feel right at home when you return after a full day of exploring ruins or islands. The owners are a very good resource for planning daily activities. They are located right on the sea, but there is no beach. They also have a nice lap pool. Rates from $110/night. They also manage a cottage just down the coast. The cottage has two apartments with full kitchens and is $150 or 250/night (upstairs or downstairs). Or you can rent an apartment from them by the month, located in the heart of Punta Gorda. Contact them at coralhouseinn.com. 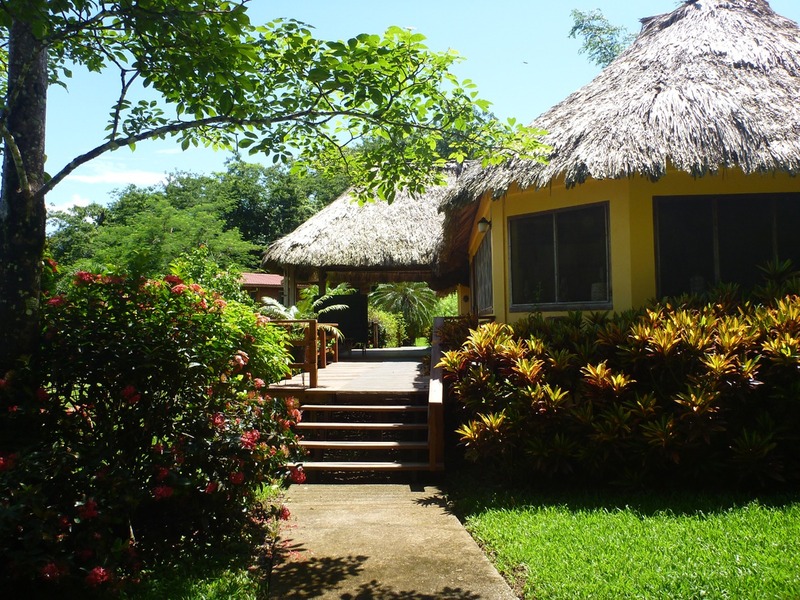 Voted the Best Small Hotel of 2009 by the Belize Tourist Board, this lodge features nice thatch cabanas located right on the Rio Grande River. The lawn around the cabanas slopes down to the river bank. They have a fleet of Hobie kayaks; one of their tour options is to drop you off upstream and you paddle this flatwater stream unguided back to the lodge. The owners have lived in the area for a very long time, and used to publish a small magazine about Punta Gorda, so their local knowledge is extensive. There is a wonderful pool on the property and some of the rooms have kitchens. Rates are from $236/night, depending on the season. Contact them directly: thelodgeatbigfalls.com. Located way down south near Punta Gorda, and situated on the banks of the Moho River, this 100 acre property delivers the best in eco-tourism. Activities available onsite include birding, horseback riding, kayaking, swimming, or simply relaxing in a hammock on your cabana porch. 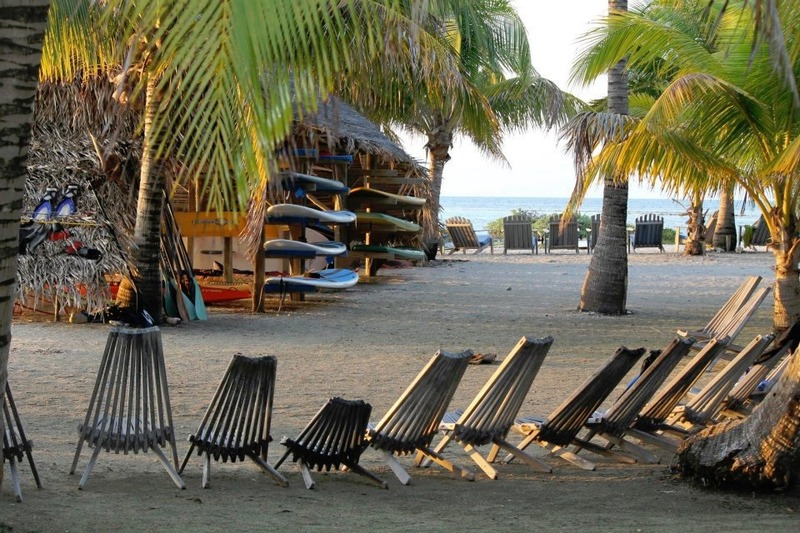 They also will help you organize day trips for snorkeling, diving, fishing, or sailing to the nearby cayes. All cabanas are fully screened with thatched roofs, private bathrooms, ceiling fans, and hammocks. Wifi is available in the main lodge. They have an organic garden onsite and also purchase food from local farmers. Rates are from $196-$394/night, depending on the season and which room or cabana you choose. Contact them at cottontreelodge.com. Xunantunich (pronounced “CHEW-nahn-too-neech”) is one of the easiest-to-reach and the most-restored ruin in Belize, and it lies just eight miles from the Guatemala border. Perched high on a hill overlooking the Mopan River, this complex was a major ceremonial center during the classic period of the Maya. Beautiful stucco reliefs are on display and excavation projects continue. From the top of the nearly 150 foot “Castillo” one can see for miles into neighboring Guatemala. Simply drive or take a bus west of San Ignacio to the ferry at Benque Viejo. The ferry across the river is free and runs about every 10 minutes. It is about a half-mile up a dirt road to the ruins. Once there we recommend hiring a guide. 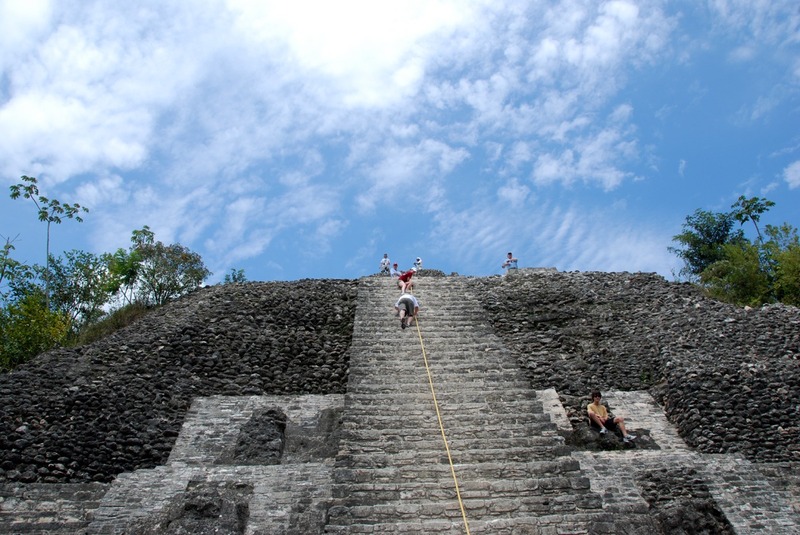 Note: Our Belize Adventure Week itinerary includes a visit to Xunantunich. If you are on the Adventure Island at Glover’s Reef trip and have one additional day before the trip you can rent a car from Belize City, visit the Belize Zoo, continue on to Xunantunich, and get back in time to make it to our meeting at the Biltmore at 5:30 p.m. 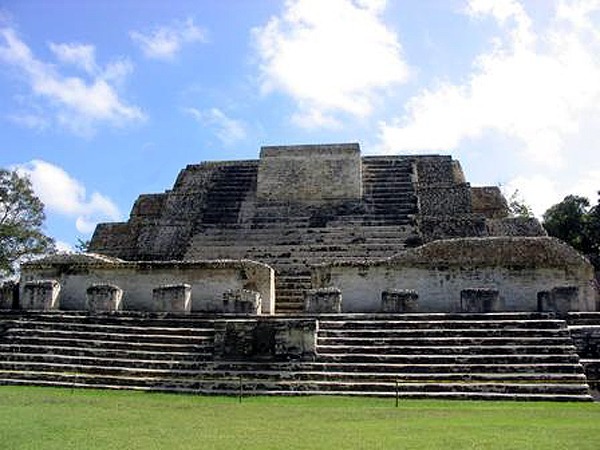 This one day Belize ruins tour is also offered for groups of eight or more. Please this page for more information on this special charter.